When the gates start loading for the 54th running of The Rebel stakes (gr.2) there will be an 80% chance of rain and thunderstorms. Although we all know the weather can quickly change; the current forecast for Hot Springs Arkansas is slated for a very wet and humid weekend! Alas, weather can surely influence the outcome of a race and a sloppy- muddy track could definitely result in surprising results. With a much smaller field than originally anticipated, 8 sophomores will be taking a plunge in stretching out to 2-turns (some for the first time). With the end in mind; trainers/owners hope their young colts will thrive the added distance when stretching out to 2-turns. A victory will guarantee the winner a spot in the Kentucky Derby since only the top twenty 3-year olds will make it to the gate on the first Saturday in May. Things are starting to brew as we all jump aboard the Derby Trail! The end of January marks the start of the South Florida Prep Series leading up to the Florida Derby and it all starts today with the Holy Bull Stakes. I can’t believe how quickly time has passed, and we are all starting to form our own opinions on who’s got what it takes to earn a prestigious spot in this year’s Kentucky Derby. A wide open filed of eleven colts will be lined up to go 1- 1/16 miles. For most, this will be the first time stretching out 2-turns, but for a few– they have ran and actually won at today’s distance. 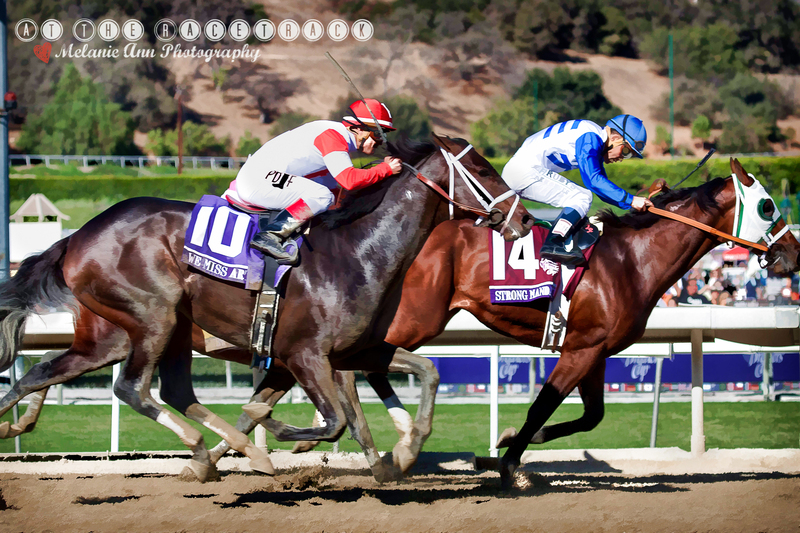 I am counting down the days to this year’s Breeder’s Cup races . 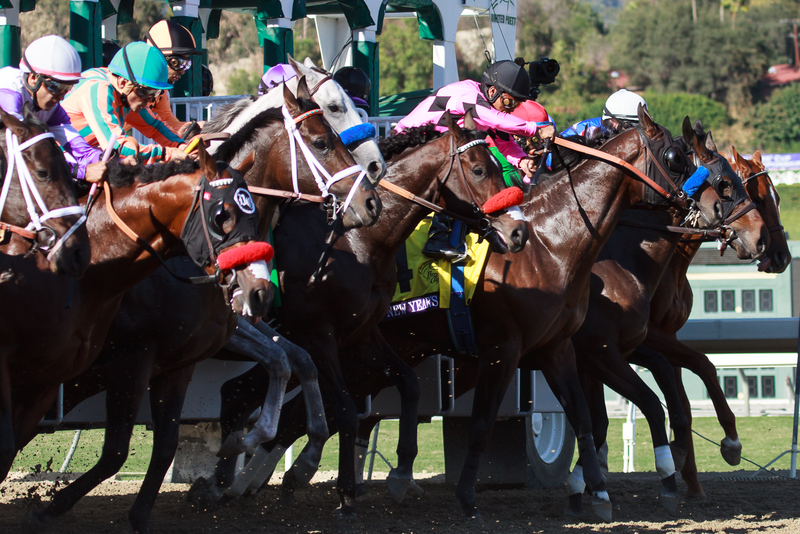 Santa Anita Race track is our favorite track in California and yes, we prefer it over Del Mar, but it’s just our personal preference because Del Mar is also a beautiful track. The track is nestled at the foot of the San Gabriel Mountains and the scenery looks like something you’d see on a post card. 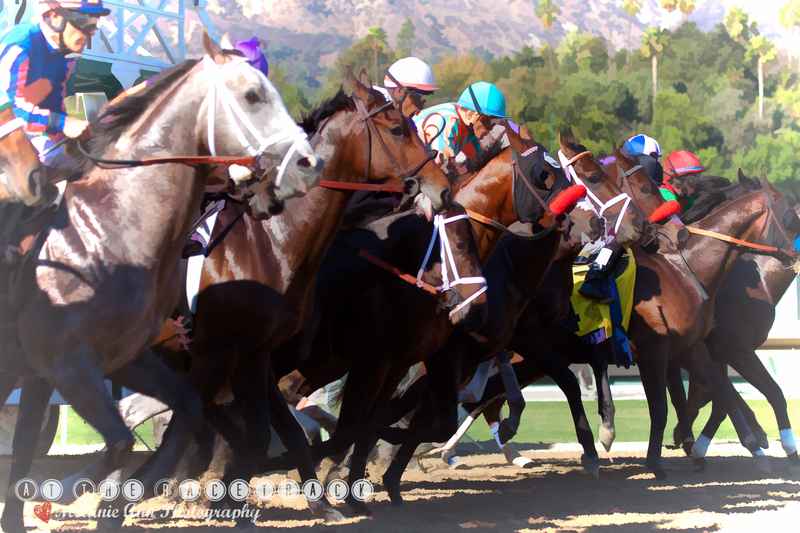 I kid you not, it’s beautiful and a visit to Santa Anita should be on your bucket list; if it isn’t already, and if you haven’t heard about this yet… Next year’s Breeder’s Cup races will once again be held in Arcadia, California! 3-straight years in a row, how exciting! 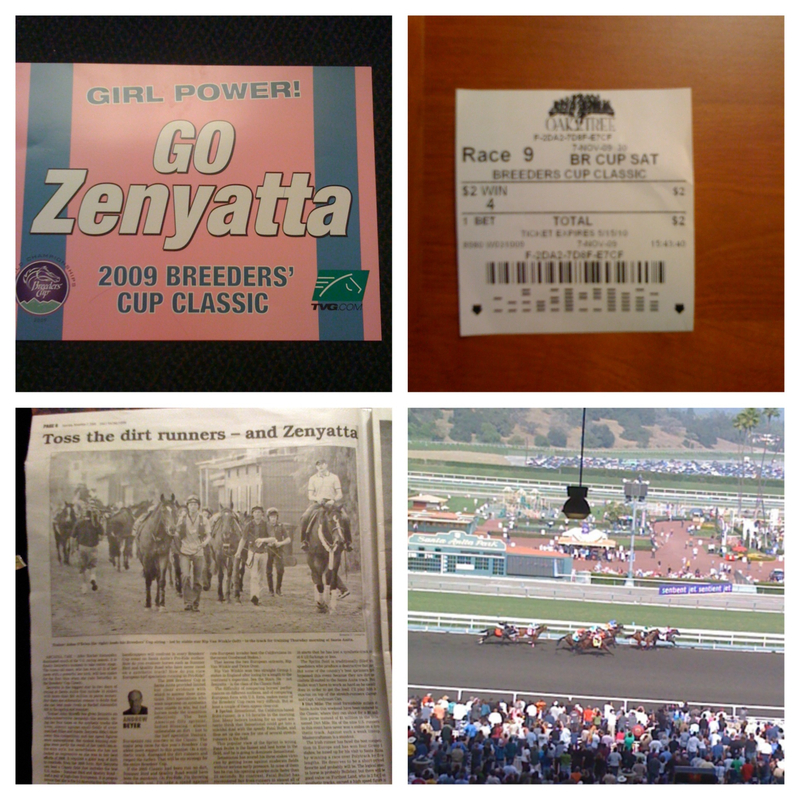 My very first visit to a race track was at Santa Anita for the 2009 Breeder’s Cup Races and for a newbie just learning about the sport; I was in awe. How lucky was I to have my first racing experience to be at the Breeder’s Cup World Championships! Everywhere around me was filled with excitement. 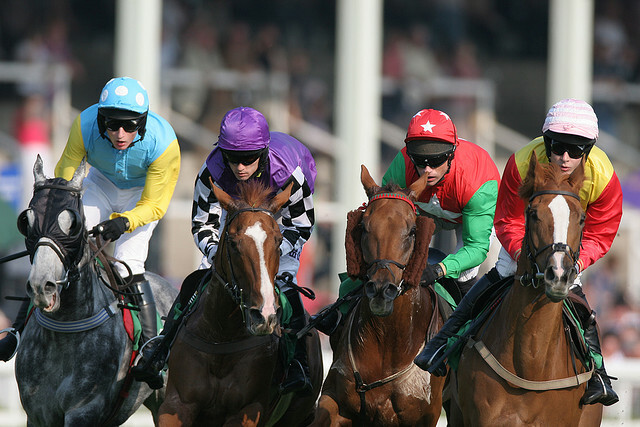 The racing fans, the horses, the jockey’s the energy was buzzing around me, and it took me awhile to catch my breath! “This is Un—Be—Liev—Able! Zenyatta! What a performance one will never forget” …. 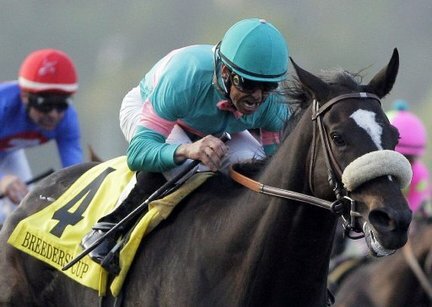 Yes, one of my favorite horse’s of all time… The Great, Zenyatta. There were many in the industry who doubted her ability to triumph against the best male horses in the world, but this would be her time to shine. The public loved her, and everywhere you looked there were people holding these awesome signs: Girl Power! Go Zenyatta. I love to collect horse racing memorabilia, so my sentimental bet was a $2.00 win ticket on the #4 in Race 9 of the Breeders Cup Classic race. I still get super excited when I watch this A—Mazing race! Just imagine yourself in the middle of this excitement as people around you are cheering, then crying tears of joy as Zenyatta became a part of racing history. She scored her 14th straight victory, and become the first female horse to beat the males in the richest race in all of North America. What a memorable moment for everyone in the crowd to have been there to watch Zenyatta’s spectacular race! Great weather, and firm turf is in the forecast for tomorrow at Keeneland Race Track in Lexington, Kentucky. The Queen Elizabeth II Challenge Cup S. – Grade 1 has a competitive field of 9 talented fillies going a distance of one-eighth mile on turf. This is an important prep race to the Breeders Cup Filly & Mare Turf which will be held at Santa Anita Race Track on Saturday, November 2nd. This race was first inaugurated on October 11, 1984 in honor of English Royalty Queen Elizabeth II who was in attendance for this first race. The time record for this race at the current one-eighth mile distance was set my Memories of Silver in 1996. Her daughter Winter Memories ran this race back in 2011. She was went off as the favorite at 7-5, but unfortunately came in 4th with filly Together winning this race. Emotional Kitten has improved numbers in race rating, and class rating from her last race. She is the only filly who has won at Keeneland, while breaking her maiden over the main course. 24% Trainer: Shipper + Hot Jockey + One of the best turf speeds + finished 3rd in last race. She has not won a graded stakes yet, but she has ran second to Del Mar Oaks winner Discreet Marq and American Oaks winner Emollient. She could be in striking position if the leaders falter and like I previously said, a “Kitten” horse on turf, at Keeneland… watch out! It’s a great field of talented fillies good luck to everyone!